McCann Berry Farm in Woodstock, Illinois is celebrating 36 years of u-pick berries! 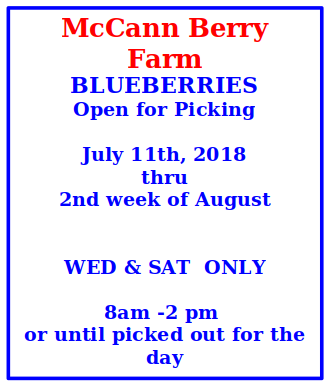 Beginning 2018 we will focus on growing Blueberries for U-Pick. Picking Season: Early July through 2nd week of August. Be sure to call or check our website for berry availability before you come out. Wednesdays: 8 am until picked out (generally by 2 pm). Saturdays: 8 am until picked out (generally by 1 pm).